Today’s consumers expect relevancy and timeliness in their interactions with brands. They want a consistent experience as they move between web and mobile channels and between stores and digital devices. Brand and agency marketers have more data, more technology and more sophisticated tools for connecting with customers than ever before, but they have yet to create the kind of one-on-one experience customers expect. Signal wanted to better understand how to help marketers get more value from their technologies. In September 2014, Signal conducted a global online survey of 281 brand and agency marketers spanning 16 industry verticals to explore the challenges faced by marketers in fully leveraging their technology and tools to deliver a next-generation, cross-channel experience. Technology fragmentation is a key obstacle for marketers, fully half of whom say the lack of coordination impedes true cross-channel success. However, more than half of marketers have yet to link their technologies beyond the most basic level, and a fully-optimized technology stack remains an elusive goal for a significant majority of marketers. 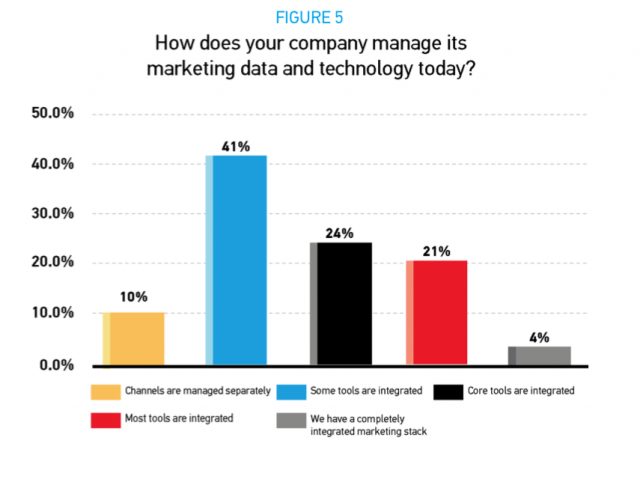 In light of these findings, marketers who want to launch successful cross-channel initiatives should rank technology integration as a top priority, make their data easily available across their disparate technologies, and work on realigning their organizations to become customer-focused rather than channel-focused. Marketing technology is evolving at lightning speed – in both breadth and complexity. Today marketers can choose from thousands of software platforms and specialized solutions for email, search, CRM, paid and earned media, mobile, social, content, video, attribution, web analytics, audience verification, and more. Marketers are investing significantly more time and money in these data-driven tools in search of new and better opportunities for engaging with customers. Growing complexity of customer interactions put marketers under pressure to optimize their tools and prove a return on these investments. This involves the difficult challenge of managing and coordinating the growing set of disparate platforms, solutions, and interfaces in their technology stacks to provide a cohesive and engaging customer experience across multiple channels. Separate tools have unique technical foundations. They are designed for use in distinct channels rather than to work in concert with tools across channels. According to Signal’s internal research, the average marketing stack consists of as many as 17 or more tools, requiring dozens of custom integration projects that few marketers have time or budget to support. Marketers are recognizing they will be at a competitive disadvantage without a clear road map for integrating their technologies to allow for the frictionless flow of data across their stacks. Today’s always-on consumers switch seamlessly among channels and devices so quickly that it’s become incredibly difficult for marketers to engage with them effectively unless they are able to react as quickly as customers move. Insight #1 – Marketers are spending more money and time on technology as the ecosystem continues its rapid evolution. If cross-channel success is reliant on coordinated marketing technology, then the bad news for marketers is it’s not getting any easier. 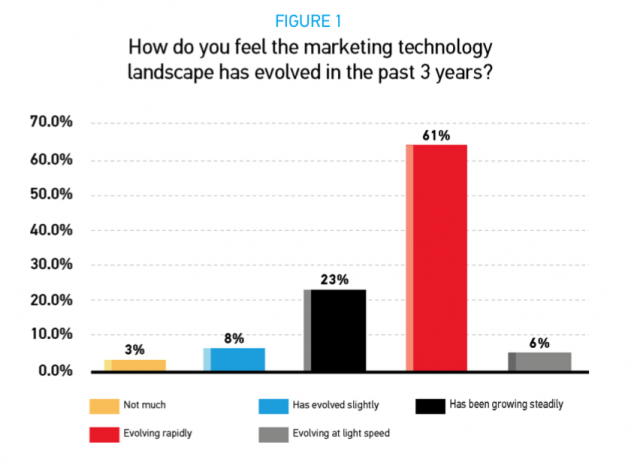 Over two-thirds of survey respondents (67%) feel that marketing technology is evolving rapidly or at light speed. New marketing technologies seem to pop up all of the time with some marketers admitting that their organizations cannot keep up with the rate of change (Fig. 1). 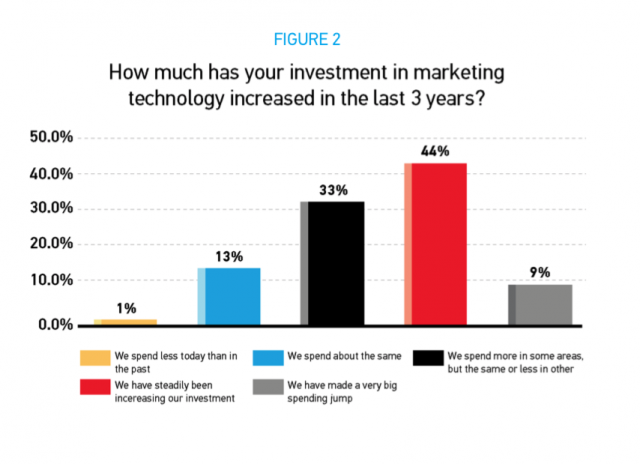 And not surprisingly, marketers are investing more in marketing technology than ever before. Less than 1% of survey respondents spend less on technology today than they did three years ago with more than half (53%) saying that they have been steadily increasing or have made a big jump in their investments over the same time period (Fig. 2). 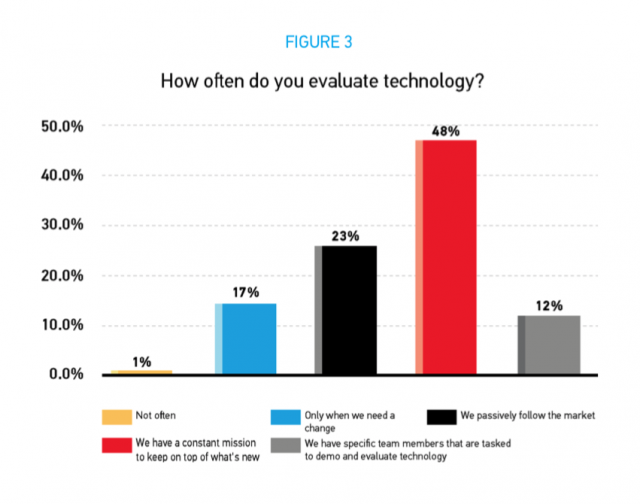 In the fast-changing landscape, 60% of marketers are extremely active in evaluting technology (Fig. 3). Insight #2 – Integrated marketing technology is key. A powerful majority of marketers believe that integrated technology can help improve key marketing capabilities. When marketers were asked where integration could help, 9 out of 10 of survey respondents answered positively in regard to the following six areas: improve customer relationships and loyalty; drive more return on marketing investment; understand and measure marketing outcomes; improve marketing agility; improve innovation; and use more relevant and impactful messaging (Fig. 4). Insight #3 – The state of integration is poor right now. Even though 90% of marketers agreed that integrated marketing technology could boost their key capabilities, only 4% — less than 1 out of 20 – marketers reported having a completely integrated marketing stack (Fig. 5). Over half (51%) reported that they still manage their tools and data separately or have loose integrations in place. However, 1 out of 4 (24%) have managed to integrate their core tools and feel that satisfies the majority of their integration needs (Fig. 5). 38% do report having some cross-channel capabilities, but only with the tools that have cross-channel features (Fig. 6). Just 4% feel that they are well prepared to move forward with cross- channel marketing (Fig. 6). 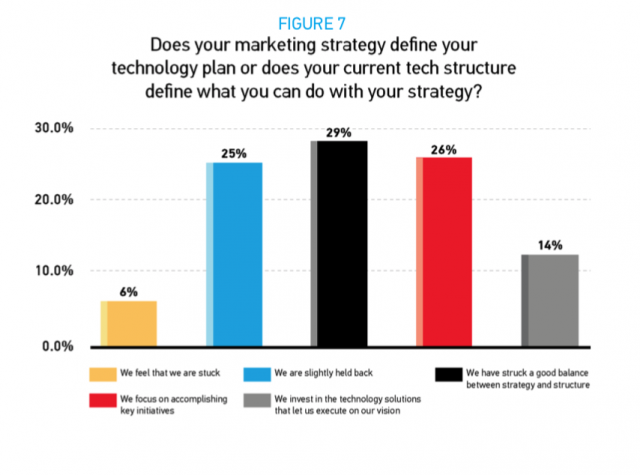 Marketers’ technology stacks are often out of sync with their strategic, cross-channel goals. Almost 1 in 3 marketers reported feeling stuck or impeded by their technology infrastructures (Fig. 7). Insight #4 – Marketers know they’re stuck, and they’re doing something about it. 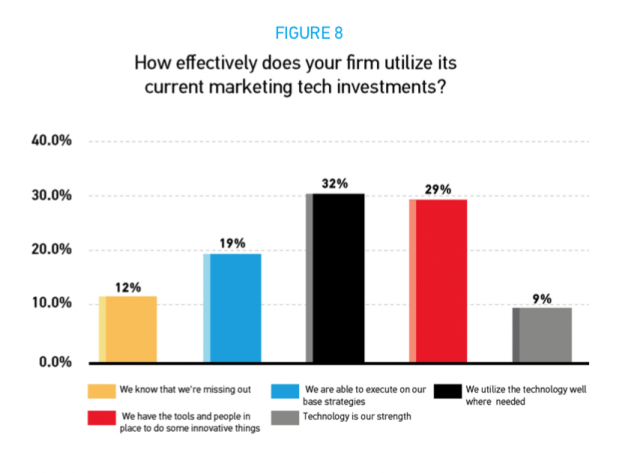 Almost two-thirds of marketers say their technologies are under- utilized (Fig. 8). 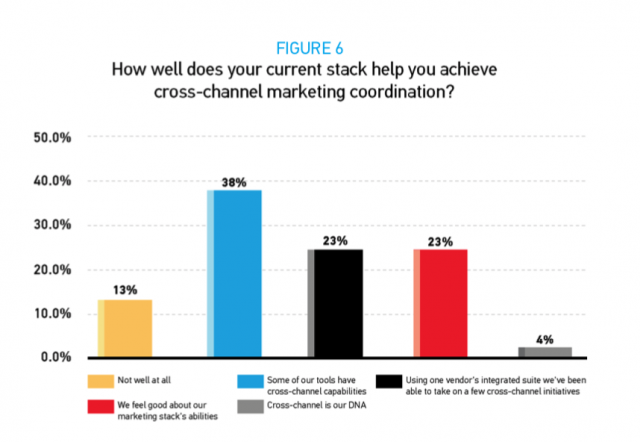 And while the current state of cross-channel, integrated marketing stacks is severely lacking, marketers are placing a higher importance on fixing it – especially within their new platform acquisition strategy. 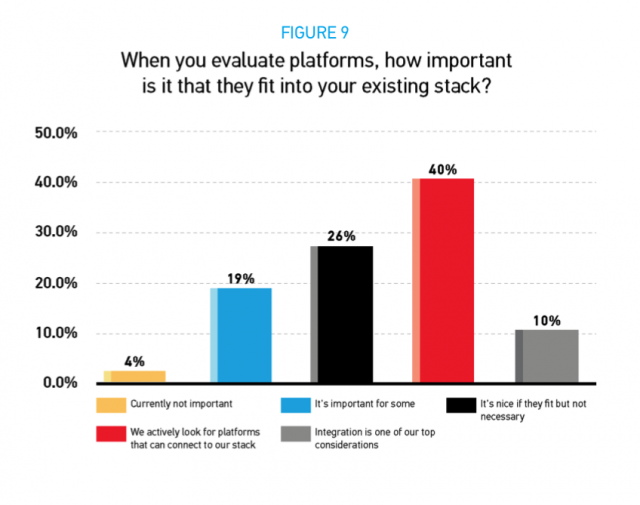 40% of respondents report that they are actively looking for platforms that can connect to the rest of their stack and enhance their overall capabilities (Fig. 9). Highlighting the move toward better coordination, 10% won’t purchase a new tool that doesn’t fit into their vision of an integrated stack– even if it’s great at what it does. Only a very small number of marketers, just 4%, don’t consider integration when evaluating new platforms (Fig. 9). 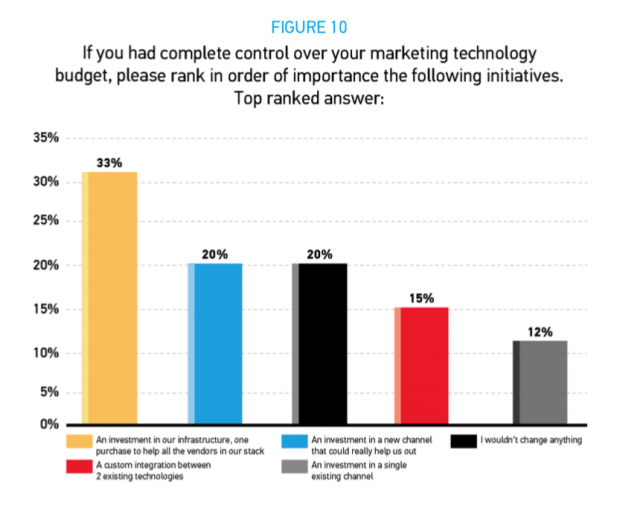 Insight #5 – Marketers want their next technology investment to strengthen their overall ecosystem of data and technologies. 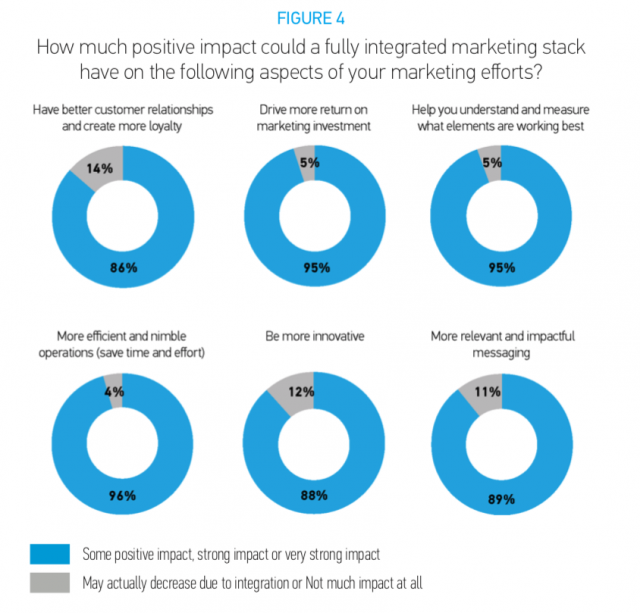 The most telling response within the survey was that 1 out of 3 marketers — when asked to choose the most important area in which to spend their marketing technology budget — said they would invest in their marketing infrastructure by purchasing technology that helps all of the vendors in their stack do a better job of connecting with customers (Fig. 10). Make integration a chief priority in your marketing technology acquisition strategy. To date, infrastructure has been a relatively ignored area of importance for marketing organizations. The dominant strategy over the first twenty years of digital marketing has been to keep adding more and more single-point platforms to solve the challenges of the day. As consumer behavior has started to outpace the ability of marketers to respond quickly, it’s becoming clear that a new approach is needed. Starting now, raise the level of priority for integrated technology as part of your vendor strategy. Make sure that all of your teams are trained in this area and that technology vendors you evaluate understand that integration is an important point of differentiation that you will be looking for when they pitch their solutions. Write integration sections into your Requests for Information (RFIs) and, when sitting down to review these documents, be sure that your team follows through and places a higher value on vendors that provide clear road maps to making their technologies connect to the rest of the digital marketing ecosystem. Because most marketers review their various technologies every 2-3 years (or even more often), over time, your organization will move towards a more complementary, integrated set of tools. Let the customer experience guide your requirements and priorities. Customers today expect timely, relevant and personalized interactions. The ultimate purpose of acquiring data and technology is to develop and execute experiences that resonate and cultivate a mutually beneficial relationship between brands and customers. Technology investments and integration projects must be designed to support this goal. Organizations that implement technology without a clear line of sight to customer experiences will find themselves limited rather than empowered by their tools. Take a top-down approach to building data and technology requirements. Design the type of customer experience that your organization wants to deliver to customers, on your website, mobile apps, email, social media, digital ads and beyond. When mapping out your cross-channel requirements, consider more than each individual channel on its own. Look at the bigger picture of how customers interact across touchpoints on their buying journey. Let that be your guide for defining the appropriate technology and implementation needs and assessing the impact of a particular tool on the total customer experience. Implementing and integrating technology in line with the customer and the customer journey is the surest way to provide return on marketing investment. Technology is just one hurdle – organizational and execution challenges still need to be addressed. but it’s only the first leg of the trip. Many marketing organizations are hampered on the journey by the struggle to staff their organizations with the right skill sets to launch and manage cross-channel initiatives on an ongoing basis. Often staffing is siloed into groups with no visibility into one another’s programs, limiting collaboration. Recruiting and retaining talent is difficult in a competitive job market. Mastering cross-channel requires a marketing organization that is designed to break down silos, create internal alignment and drive real value across the enterprise. Staffing is a critical factor. The right skills and technical expertise must be gathered in-house or through agency, vendor and other third-party partnerships. This evolution will not just help your organization become better at marketing, but just might be the difference between success and failure in the new era of the always-on, cross-device/cross-channel consumer. Marketing is one of the most data-driven and technology- dependent functions in the enterprise. While they have access to more data and more advanced technology than ever before, marketers still struggle to reach their cross- channel goals. They’re realizing the answer isn’t necessarily adding more single-point technologies to their stacks. It doesn’t make sense to keep buying more mono-channel tools when their existing tools and data are so underutilized and fragmented. In planning their next technology investments, marketers are looking for ways of improving the entire customer experience across touchpoints and channels. Fully optimizing their technologies requires a clearly-defined roadmap for moving data across their stacks as quickly as their customers move between laptops and smartphones and stores or call centers. Getting their technologies to work better together will move marketers a giant step closer to their goal of delivering a seamless, next-generation customer experience across multiple channels.